On Sunday night we shot a promotional video for British charity "The Real Bread Campaign" a group who fight for the production, sale and consumption of bread made with real ingredients (see http://www.sustainweb.org/realbread/ for more info). There were seven puppeteers involved in the shoot; London School of Puppetry students, graduates and Caroline herself (head of the school). 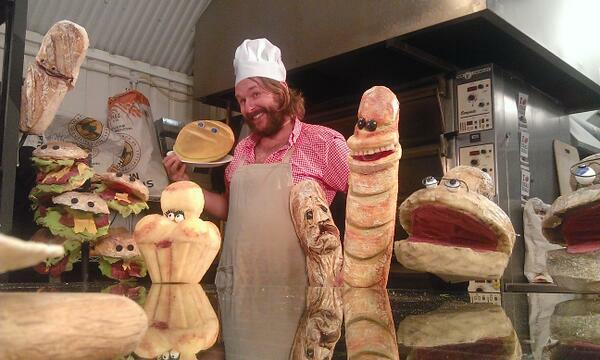 We operated lip sync and rod puppets created by LSP students and graduates; puppets styled to look like various types of bread! The building of these puppets was something I unfortunately missed due to my injury earlier in the year, however I was wrapped to have the opportunity to be apart of the shoot. I operated two cottage loaves that looked distinctly like Grannies, built by Caroline. The shoot took place in a bakery in London (The E5 Bakehouse) and ran for six hours, 6pm-MIDNIGHT. It was an incredibly enjoyable experience as everyone on board was enthusiastic, organised and behaved in a very professional manner. We worked to a song written specifically for the promo and were asked to record our voices for the audio. This was very funny as each puppeteer had chosen some silly voice for their character, or in my case, two characters. We all had to swallow our giggles as this went on so as not to ruin the recordings. The sound engineer seemed to be doing the same! With a fantastic crew, lovely actors and a band of crazy puppeteers, this night was a lot of fun. Not to mention a very patient, supportive and enthusiastic director in Perrin Sledge. Though my arms and hands were tired, and I wandered home exhausted (well past my bedtime), it was all worth it. I feel very happy to have been apart of this project and wish The Real Bread Campaign every success with their mission! I will post the finished video in my Gallery as soon as it is released.